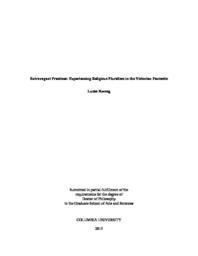 This dissertation explores how Victorian fantastic fiction reimagined an experience central to its era: the full range of affective responses to religious pluralization, from devotion to disillusionment. Indeed, "Extravagant Practices" argues that authors of the fantastic gave voice to late Victorian Britain’s dawning awareness of creeds outside the Judeo-Christian tradition. Toward the close of the nineteenth century, three interrelated developments fueled this awareness: unprecedented proximity to Asian traditions, made possible by imperial circuits of knowledge; comparativist accounts of world religions, which stressed their hidden unity; and the array of esoteric spiritual movements, such as Theosophy and occultism, in which “Christian Britain” took increasing interest. These developments exerted powerful but conflicting pressures on believers and freethinkers alike. In yoking supernatural events to naturalistic detail, authors such as Rider Haggard, Rudyard Kipling and Bram Stoker found a way to capture the sometimes exhilarating, often disorienting experience of exploring religious difference at the fin de siecle. Far from offering mere escapes from disenchanted modernity, then, the fantastic fictions surveyed in this dissertation illumine the complex religious lives of the late Victorians.